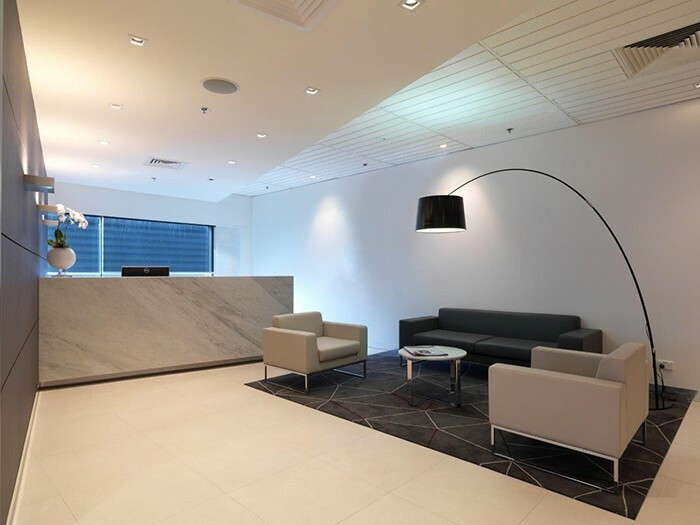 ODC Design was engaged by Garnaut Private Wealth to deliver a freshly designed high-end fit out for their new office space located at Level 8, 468 St Kilda Road in Melbourne. A key focus of the project was to enhance the surrounding views of Albert Park Lake by including cleverly constructed angled walls to the front of house areas, which create an open environment and maximise the abundant natural light. The design of the fit out adopts a modern contemporary theme, extending to the reception area which emulates quality and sophistication, yet maintains a warm and welcoming atmosphere. The custom designed front of house desk and joinery has been specified with hand selected marble, wall paper panelling and a custom designed rug, ensuring longevity and resonating the warmth intention. The vibrant break out area was designed to promote a flexible and collaborative work space for staff, in addition to integrating personality with the inclusion of a patterned ceramic splashback and red linear hanging pendants, whilst contrasting with the neutral surrounds.